Do you volunteer in your local community? Are you part of a community organization looking for strategies to empower your volunteers and promote leadership? Or, are you interested in learning more about food justice? 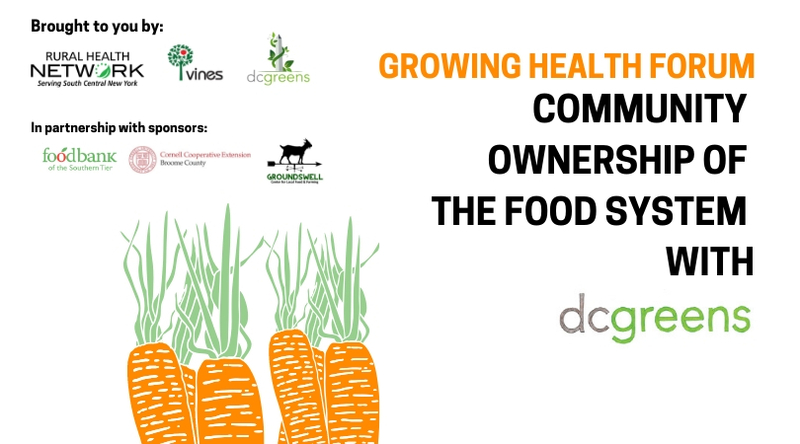 Please join us for Growing Health Forum: Community Ownership of the Food System with DC Greens for an educational event made for you! Creating equitable community food systems requires placing people most impacted by food injustice at the center of changes moving forward. Join us for a Growing Health Forum featuring a presentation by DC Greens, a food justice organization located in our nation’s capital on promoting volunteer and community leadership, transitioning programs and policies to a focus on food justice, and a discussion on programs to best engage community members. Lunch will be provided and followed by a training led by VINES, RHN, and FBST on promoting volunteer leadership strategies. The forum will be child friendly, and if transportation is an issue please contact Tom Lewis, at tlewis@rhnscny.org to work out a solution! The event is free but registration is required. Printing out a ticket is not needed.